Hurricane Michael traumatically injured Gulf Coast Regional Medical Center, whose mending would test the mettle of the Hospital Corporation of America, solidify relationships among its Panama City employees and yield a welcome byproduct — newly intense loyalty to community and employer. Remarkably, less than a month after the storm struck on Wednesday, Oct. 10, Gulf Coast was able to restore inpatient services. Operating rooms and cardiac catheterization labs were back in operation. Beds, including critical care beds, were ready for patients. Pediatric and neonatal intensive care units were back online. And the hospital was delivering babies again. How that comeback was accomplished is a story involving interagency cooperation, the marshaling of resources from around the region and country, the benefits of planning and even, as it happens, a cameo appearance by a Russian tortoise. Two days prior to the storm’s landfall, hospital leadership met to discuss whether to begin canceling surgeries. There was a reluctance to do so. 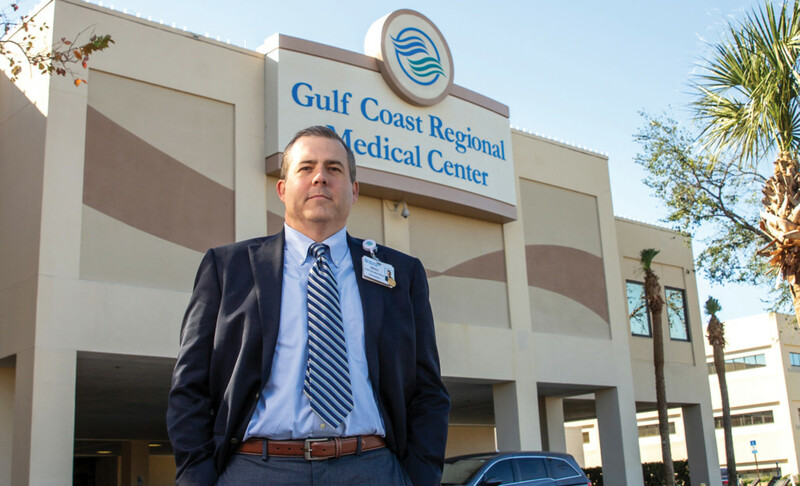 “People plan and prepare for surgeries,” said Gulf Coast CEO Brad Griffin. Griffin was not a total hurricane novice. He was a hospital CEO in South Carolina when Hurricane Matthew buzzed that state’s coast in 2016. His hunch about Michael led Griffin to insist that his wife evacuate with his sister to Birmingham, Alabama. While hesitant, she agreed and left town with the couple’s two children and a dog, leaving two other critters behind. As Michael neared landfall, Gulf Coast’s patient census stood at 140. In addition, the hospital’s staff, family members, physicians, first responders and 28 pets would shelter in place at the hospital. Just shy of 600 people waited at the hospital for the storm to check in. It would do so rudely. “When the storm came through, we had some roof failures and water came in,” Griffin said. “Coated flat roofs don’t do very well in high winds. They didn’t separate from the building, but air handlers on the roof were shifted. Caps and fans blew away and that allowed water to intrude. Gulf Coast is licensed for 223 beds. Of that total, 76 are on the third floor, which sustained the heaviest damage. After the windows blew out, the pressure inside the building changed discernibly in the way that a jet might lose cabin pressure. Immediately, hospital leadership reacted by relocating third-floor patients to other areas of the hospital, wherever there was room. With the storm hundreds of miles off in the Gulf of Mexico, HCA had prepositioned two 2-megawatt generators on tractor-trailers at the hospital. Further, Gulf Coast anticipated that the City of Panama City’s water system might go down and was prepared to flip a switch and resort to on-premises water tanks. Those contingencies proved essential. Power and water were lost. The hospital is equipped with a chilled-water air-conditioning system. It went down when the water went out, and a plan to revert to well water was thwarted because the storm had ripped away the above-ground plumbing tied to that alternative. The loss of sewerage occurred when a lift station near the hospital failed — the stuff doesn’t roll sideways. “We had a mini-Super Dome for a time,” Griffin said, recalling post-Katrina New Orleans. “It was hot, you couldn’t use the water because we didn’t want the drains backing up and you couldn’t flush the toilet. Thankfully, our plan-ops guys got the well restored (before sunrise Thursday) and we got our air back. That was a big, welcome development” — one that signaled that a return to some semblance of normalcy might be coming. Gulf Coast knew that it would have to begin evacuating patients Thursday. Griffin and key managers devoted Wednesday night to working on details, marking out on a site map, for example, areas for use as temporary helipads. Determinations had to be made as to where patients would be going. Road closures might dictate the routes that “trucks,” as Griffin calls ambulances, would have to take. Ultimately, evacuated patients were transported Thursday and Friday to sister HCA hospitals in Tallahassee, Pensacola, Fort Walton Beach and Niceville. When, after three days, toilets were ready for action, the hospital had to take steps to ensure their restoration was orderly. Meanwhile, the hospital and the community at large were dealing with a communication crisis. Among cell service providers in Bay County, Verizon had an 80 percent market share and its towers and lines lay in ruins. Under the circumstances, exaggerated rumors became communication currency. “We heard at one point that the county’s emergency operations center had burned down,” Griffin said. None of those stories proved true, but the possibility of large influxes of patients had been the subject of discussions among HCA, state and federal officials. As a result, FEMA and the National Guard established a Disaster Medical Assistance Team outpost in a parking lot outside the Gulf Coast emergency room, which remained open after the storm passed. Staffed with medical professionals, the mobile hospital looked just like a M.A.S.H. unit, minus Alan Alda. The hospital and the DMAT arrived at triage protocols that dictated where incoming ER patients would be seen. At the time, about 100 were arriving each day. Presence of the DMAT helped Gulf Coast reduce the number of people working in the hospital and pave the way for reconstruction work. So, too, did a FEMA base camp that was set up in another part of the parking lot. It provided living quarters for first responders and included a cafeteria that served three meals a day. Griffin isn’t sure how — there was no cable service in the hospital building — but somehow the campers got reception and tuned in to Monday Night Football. Corporate support was timely and intelligent and essential to the hospital’s recovery phase. “HCA stepped up in a number of ways in addition to the prepositioning of assets,” Griffin said. “They sent teams of contractors from mediation crews to industrial hygienists. First, there is an initial clean including water extraction. Before you start tearing things apart, you have to have a plan. The industrial hygienists do moisture mapping, identifying which walls need to go or how much of a wall needs to go. Remediation crews come behind them and execute the plan, cutting out drywall. Containment steps are taken to protect areas of the hospital unaffected by the storm. Contractors come in and build things back. Equipment loss due to the storm had been slight apart from the loss of a CT scanner, but the hospital was surrounded by a community that had been torn to shreds. Employees, especially some who had ridden out the storm at home, were rattled to the point of experiencing PTSD-type symptoms. A hot meal, apart from those distributed by the Red Cross and other relief agencies, was hard to come by. Corporate extended a hand. “HCA has an internal Hope Fund funded by the company and donations from employees across the country,” Griffin explained. HCA sent employees from its hospitals elsewhere to spell Panama City employees and give them a chance to assess their personal situations. For example, Carlton Ulmer, the CEO at West Florida Hospital in Pensacola and formerly the CEO at Gulf Coast, arrived to give Griffin a break. “Corporate committed to keeping employees whole financially, and that came as a great relief,” Griffin said. Griffin said he spoke with a doctor who was angry about the storm, but said it made it clear to him that Panama City is where he wants to be. Doctors struggled personally and professionally after the storm. Michael destroyed a medical office building that adjoined Gulf Coast. HCA extended credentials to doctors who had been practicing exclusively at Bay Medical Sacred Heart hospital, located near the historic center of town. Many took advantage. For months after the storm, Bay Medical Sacred Heart was limited to ER operations. In November, it laid off some 800 employees. Panama City Mayor Greg Brudnicki was instrumental in seeing to it that Bay Medical didn’t have to shut down altogether. Briefly, FEMA covered the cost for ambulances to transport patients out of Panama City. Then, the state assumed that expense but informed Bay Medical and Gulf Coast that funding would be suspended after 30 days. The cost for ambulances provided by private services was “ridiculous,” Griffin said. Brudnicki calculated that it was running $9 million a month. City, county and hospital officials met with state officials to discuss the planned funding cutoff. As a product of the meeting, the state agreed to extend funding on a week-to-week basis. Eventually, a utility crew from Mississippi restored power to the hospital. The crew announced on arrival that it would not be leaving until they got that job done. Medical offices in close proximity to the hospital benefitted; the same crew got their lights back on. The communication crisis was eased when Jimmy Patronis, the state’s chief financial officer and a Panama City Beach resident, supplied Gulf Coast with 100 burner phones he obtained from a contact with Motorola. Upon finally discharging himself from the hospital, Griffin headed to his home in Bay County’s beaches area. He carried with him a cat and a Russian tortoise that rode out the storm in Griffin’s office. They had been left behind when Griffin’s wife departed for Birmingham. No collusion with Russia was involved in obtaining the tortoise, Griffin said.